Like most rabbis I read a lot of sermons that other rabbis have delivered. After this past Yom Kippur someone sent me a particularly good sermon that was rather risky. Rabbi Donald Weber even prefaced his Yom Kippur sermon by admitting that it would be a gutsy sermon to give. The rabbi of Temple Rodeph Torah in Marlboro, New Jersey told his Reform congregation that in over twenty-five years (and over 100 High Holy Day sermons) he never spoke about interfaith marriage from the pulpit as it was considered to be the "third rail of the Reform rabbinate -- you touch it and you die." In Rabbi Weber's well-crafted sermon about interfaith marriage, he chooses his words carefully and explains that he does not want to hurt anyone with his remarks. The chidush (new idea) of his sermon was that he came up with a way to help curb the rising rates of intermarriage within his congregation. He announced in his sermon (MP3 version) that he and his wife, Shira Stern, would personally pay out of their own pocket for a six-month membership ($149) to JDate for any young singles in his congregation who asked. In his sermon, he told the single Jews in the pews that the survival of American Judaism in its current form depends on their decisions. Rabbi Webber's JDate generosity made national news. 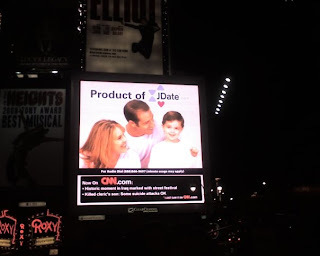 Six weeks after he delivered his Yom Kippur sermon at Temple Rodeph Torah, USA Today published an article about his idea to promote marrying within the Jewish faith through JDate.com. In the January 21, 2008 issue of Newsweek magazine it was reported that Rabbi Weber and his wife have paid for 24 six-month subscriptions from their own personal funds. Two other rabbis, Rabbi Kenneth Emert of New Jersey and Rabbi Michael Cahana of Oregon, have begun funding the six-month JDate subscriptions for their single congregants from their rabbinic discretionary funds. The Newsweek article states that two rabbis have also negotiated a bulk rate discount for rabbis who want to buy membership accounts for their congregants (this was also covered in the JTA blog). The rabbis say they felt compelled to act because of the gradual dilution of the faith through marriage. Almost half of American Jews marry non-Jews, a rate of exodus that has more than tripled since 1970. "This is about creating an opportunity," says Cahana. Sometimes even Cupid needs a nudge. JDate certainly works. Almost half of the weddings I have officiated have been for couples who met on JDate (including one eHarmony wedding). If a Jewish couple didn't meet in high school or college, I have come to assume they met each other on JDate. It will be interesting to see how many weddings Rabbi Donald Weber performs from the individuals who received a free JDate subscription from him. If every rabbi provides free subscriptions I am certain the intermarriage statistics will change positively.